Tharparkar (or Thar as it is more commonly known), in Pakistan's Sindh province, is the world’s seventh largest desert. It lies about 400 kilometers East of Karachi, covers an area over 19,638 square kilometres, and has an estimated population of more than 1.25 million. 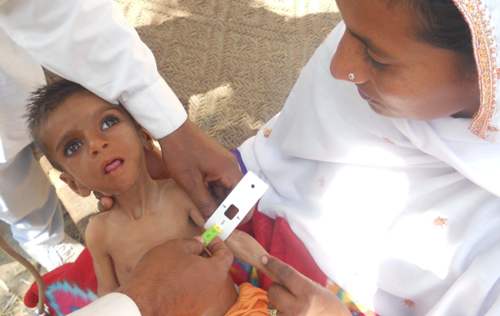 A majority of Thar's population & livestock has been affected by the ongoing drought/famine situation. Over 200 people have died, with over 175,000 severely affected. Livestock numbers are also decreasing fast as the drought-famine lingers on. Diseases like Diarrhea, Malaria and Pneumonia are spreading. Sending out 10 truckloads of Food, Drinking Water, Medicines & other Essential Relief Supplies to Thar. Mobilizing around 300 volunteers, including a team of 12 Doctors & 18 Paramedics to assist with the relief efforts. Setting up 4 Health Clinics, a Veterinary Clinic, and a Kitchen.